Come, Holy Spirit, by whom every devout soul, who believes in Christ, is sanctified to become a citizen of the City of God! (en. Ps 45:8) Come, Holy Spirit, grant that we receive the motions of God, put in us your flame, enlighten us and raise us up to God (s. 128,4). With the heart well disposed, with serenity, read slowly the following words, savoring them and allowing yourself to be touched by them. “Therefore, given that the Lord Jesus Christ chose fishers of fish and made them fishers of men, right in the acts of fishing, he wanted to indicate to us something on the call of the peoples to salvation. … The proclamation of the Gospel was something new; then, he found them in the task of fishing, he approached them and told them: “Cast the nets” (Lk. 5:4). They answered him: The whole night we have caught none, we labored uselessly; but in your name, we will cast the nets (Lk. 5:5). They cast the nets, and caught so great a number that they filled the two boats; these boats were so overloaded with the weight of the number of fish that they were almost sinking. Furthermore, because of the quantity, their nets were tearing. 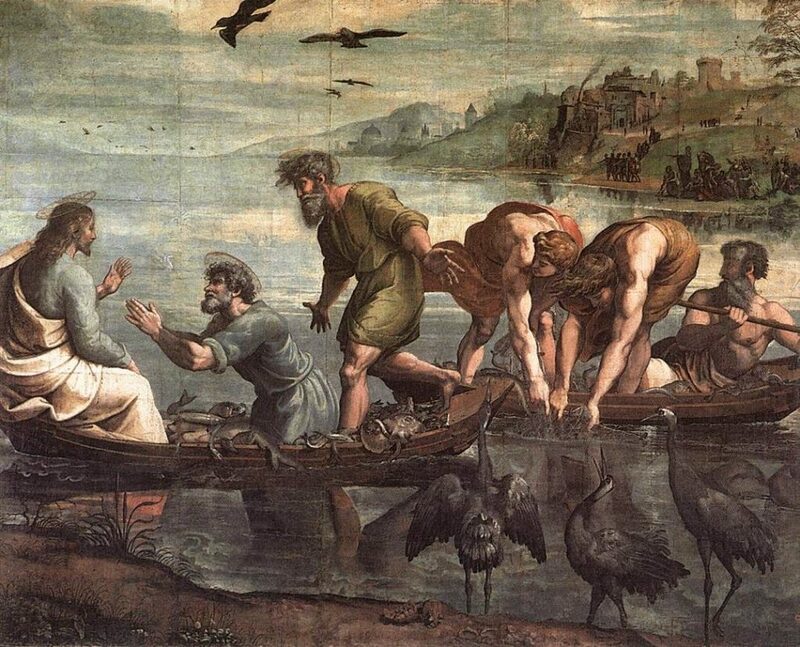 Then he told them: Come, follow me and I will make you fishers of men (Lk5:11). Right away, leaving behind the nets and the boats, they followed Christ. (In the nets, fishes are caught) the good as well as the bad. Of these, the Gospel speaks in another place: the Father of the family sent out his servants when the dinner was already prepared, and they brought in whomever they met, the good and the bad, and the wedding banquet hall was filled with guests (Mt. 22:10). Such is the Church at present; it is filled with the good and the bad. A multitude fills her, but at times this same multitude oppresses her and wants to cause her shipwreck. The multitude of those who live bad lives perturbs those who live good lives, up to a point that those who live holy lives believe that he/she is a fool when he/she sees other living bad lives. Above all when it is seen that as regards the goods of this world, many wicked are happy and many good persons are unfortunate. How much is it to be feared that this weight make them sink and cause them shipwreck. How much should we fear, dearly beloved, that one who lives a holy life may say: “What is the use of living a holy life? Look at that one who lives an incorrigible life, he is more honored and respected than I. What Advantage do I get for living a holy life?” My life is in danger, I fear it will sink! I will seek someone who lives a holy life, that he may not sink the more: “Live a holy life; do not get tired, do not look back. The promise of the Lord is sure: Whoever perseveres to the end, shall save his soul” (Mt.24:13), (s. 90, 8). With the text, let us now pray from the depths of our heart. I suggest the following phrases and questions that can awaken in you dialogue with God, and at the same time can give rise to affection and sentiments in your dialogue with God. Do not move to the next phrase or question if you can still continue dialoguing with God in one of them. It is not a matter of exhausting the list, but of helping you to pray with some points that better fit your personal experience. “Master, we worked hard all night and have caught nothing, but at your command I will lower the nets” (Lk. 5:5). How is my trust in God? What importance does humility have in your life so as to acknowledge that everything depends on the grace of God? “Depart from me, Lord, for I am a sinful man” (Lk. 5:8). How do you present yourself before God and before men? St. Augustine said: “Thus, it belongs to the just to recognize his sins, and to the proud to defend his personal merits.” What does this statement suggest for your prayer? Contemplate how Christ invites his apostles to lower the nets and how they were surprised that, after spending the whole night trying to catch some, they can catch such a great quantity of fish. Contemplate how Christ tells you to go to a deeper spot (Lk 5:4). Allow yourself to be led by the Spirit and you row into the sea of your heart to arrive at that secret and hidden spot to encounter Jesus and you contemplate him there. Contemplate his look of love at you and allow his gaze to fill your being with peace and happiness. What concrete commitment does this text of Scripture ask of me in my spiritual life? in my community life? “Pride puts out charity; humility strengthens love; charity cancels sins. Humility pertains to confession, by which we acknowledge that we are sinners” (ep. Io. tr. 1, 6).